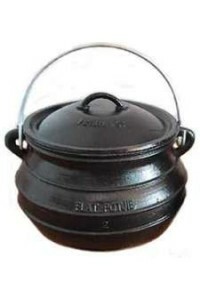 Flat bottomed food safe cast iron potjie pots can be used indoors or out. Put on a grill, even your indoor stove! Flat Bottom Potjie Pots (pronounced POE-gee) are the same, pot belly shape as our traditional Potjie Pots without the legs. The flat bottoms let them be used on any stovetop or on a grate on a grill or over a campfire. They are the perfect cooking pot for all kinds of foods from baked beans to stews and roasted meats. They are perfect for slow roasted BBQ favorites like pulled pork and beef brisket. Potjie Pots come in many sizes, from a small mini pot to a 19 plus gallon cook kettle. Potjies include well-fitted lids and strong carrying handles and are made from all cast iron. The rounded bottoms create a rolling boil motion that prevents food from sticking. Our Potjie pots are 100% food safe and pre-seasoned with a fine coating of flaxseed oil and made in the USA. With proper care, they will last a lifetime. Care instructions are included with every cast iron potjie pot.